Shopping for a new mid-size sedan can feel overwhelming, since there are so many different sedans available on the market today. But if you are in search of a fuel-efficient and sporty sedan that is stylish and refined -- inside and out -- your best bet is the 2017 Mazda6 sedan. Mazda's latest version of its popular mid-size sedan offers a superb mix of refinement and the latest technology, but perhaps what's most enjoyable about this stunning sedan is how it drives! Mazda vehicles are certainly well-known for their supreme driving dynamics, and the new Mazda6 puts other mid-size sedans to shame with its fun to drive characteristics and agile handling. One glance at the Mazda6 and you can tell that it punches well about its weight in style, substance, and value. If you live near the cities of Honolulu, Waipahu, Kaneohe, Kapolei, and Pearl City, then stop into the Cutter Mazda Waipahu showroom in WAIPAHU, HI, to further explore the Mazda6 for yourself. Our passionate Mazda sales specialists will gladly give you a detailed tour of all the innovative features found on this sleek, sporty, and fuel-efficient mid-size sedan. Find your shiny Mazda6 in WAIPAHU by shopping our inventory online or by visiting our dealership location today. Among the many updates to the already refreshing Mazda6 for 2017 is the new G-Vectoring Control system. The sporty, Mazda-exclusive G-Vectoring Control makes adjustments to engine torque to induce load transfer toward the front axle as the steering wheel is turned, thereby improving steering response. This clever technology helps this already sharp-handling Mazda perform even better around the curves. Another improvement that can be felt but not seen is the 2017 Mazda6's available i-ACTIVSENSE® active driver safety features. With a new camera, the updated i-ACTIVSENSE® setup can now detect not only cars and large objects, but also pedestrians moving into the vehicle's path at slower, city speeds. Along with the system's collision-warning function, the advanced system can automatically apply the brakes to avoid or mitigate a collision or pedestrian impact. Mazda has even tuned its innovative i-ACTIVSENSE® to recognize traffic signs -- including speed-limit, no-entry, and stop signs! Inside the cabin, Mazda has quieted down the 6 sedan's interior even further, thanks to thicker front door glass -- including the Grand Touring trim's upgraded, acoustic-laminated glass. Weather stripping, seals, and the headliner have been optimized to limit noise, too. The new Premium Package offered on the Mazda6 Grand Touring model takes this sedan to new luxurious heights; drivers can choose from almond-colored or black high-grade nappa leather seating surfaces with stunning titanium-gray piping and stitching. With so many upgrades for 2017, now is the perfect time to get behind the wheel of a sporty and sophisticated Mazda6 sedan! The 2017 Mazda6 is supremely fuel-efficient, especially when you consider the amount of power it has on tap! 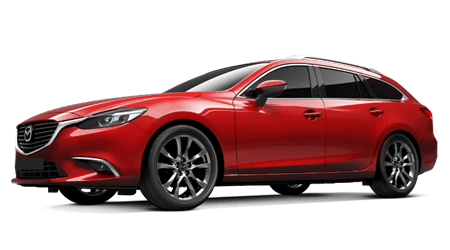 Thanks to its innovative SKYACTIV®-G 2.5-liter inline 4-cylinder engine, the Mazda6 provides 184 hp and 185 lb-ft of torque, while achieving an EPA-estimated rating of 35 miles per gallon on the highway, and up to 27 miles per gallon around town. Direct injection engine technology comes standard, while the i-ELOOP regenerative engine braking system is available on range-topping Grand Touring models and helps to further improve fuel economy. The 184 horses of the SKYACTIV®-G 2.5-liter inline-four are transmitted to the front wheels through the driver's choice of either a SKYACTIV®-MT 6-speed manual gearbox or a SKYACTIV®-Drive 6-speed Sport automatic transmission, complete with manual shift and Sport Mode. Sedans with the 6-speed Sport automatic transmission can even be fitted with steering wheel mounted paddle shifters to make this sporty mid-size sedan even more fun to drive! Distance Recognition Support System When you are ready for an upgrade to a stylish mid-size sedan that offers the complete package, get inside the Mazda6 sedan. Drivers who live near Honolulu, Waipahu, Kaneohe, Kapolei, and Pearl City, can experience the Mazda 6 sedan at Cutter Mazda Waipahu. Of course, you can also find your new Mazda vehicle by browsing our online inventory now! Shopping for your new vehicle here on the Cutter Mazda Waipahu website is a great time to submit an online finance application for your new car loan and value your trade-in vehicle, too. Once you drive off in your new Mazda6 sedan or other quality Mazda vehicle, remember that we have a Mazda auto service center at our dealership to take care of your vehicle's future routine maintenance needs.